Current day kitchens are not just utilitarian spaces. Apart from being spaces where cooking takes place, they are also used to share informal meals, kids’ homework gets done here and you may also end up completing some office work at the kitchen table as well. In short, they are multi-utilitarian spaces that have to be designed that way. When you invest in good kitchen design that adds to the functionality and appearance of the space, it increases the overall value of your home. 314 Design Studio provides excellent Kitchen Renovation services to customers across Annapolis, Severna Park, Stevensville and. They also cater to customers in and around Arnold, Chester, Cape St Claire and Kent Island. 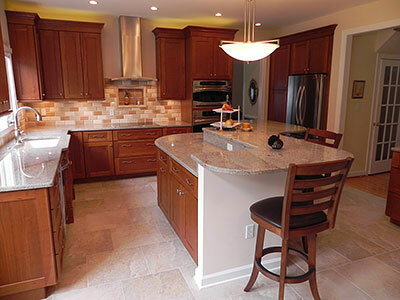 Over the years, they have handled a number of projects for customers in Centreville, Riva, Easton, Chestertown and Mayo. Consultation - This is the first and very important phase of the entire project. The designers will have detailed discussions with you to understand what your specific requirements and ideas are. They will also provide suggestions and ideas of their own and offer kitchen plan options based on the movement flow you want in this space. Material Choices - The experts will also provide you all the information you need about different materials and products. The kitchen designers will focus on providing options that will be aesthetically appealing, low maintenance and long-lasting too. This helps you make a more well-informed decision about the kind of features and installations you would like in this space. Quotes - You will receive a detailed quote based on the materials and features you want installed. Once you approve the quote, they will start on the work at the pre-decided date and time. Project Management - Credible kitchen contractors will handle complete project management. This means they will source all the materials and technicians and keep a handle on quality control. On-site supervisors will ensure that the technicians come in which regularity and complete the work efficiently and in a timely manner. They will also make sure that the personnel work unobtrusively and that the job site is left neat and clean at the end of every work day. Communication - This is very important in any home renovation project. Good kitchen installers will communicate with you regularly while the project is in progress so you are kept updated about the work that’s being done. When you want kitchen spaces that look attractive and are functional in every way it’s best to hire experts like the ones at 314 Design Studio. They will provide you customized solutions at Kitchen Installation cost that fits perfectly into your budget.